This book represents no less than a paradigm shift in ecology, as far as alien species are concerned. Fred Pearce, an award-winning environmental journalist, sets out to prove that the conventional “native good, alien bad” attitude is just a fashionable ideology with no credible science behind it, and that we should rather celebrate the “new wild” of a mix of species, including non-native ones, who are, in many cases, nature’s own way of overcoming the damage that homo sapiens has done to the common environment. The previous fashion in ecology, going back to the 19th century, was acclimatization, especially, though not exclusively, associated with the British colonial empire. In those days the fashionable thing was not to eradicate alien species, but to do exactly the opposite: collect them all over the world and try to introduce them in new countries and new continents. Kew Gardens in London was originally a holding ground for plants from all over the Empire. There was an acclimatization society for animals as well. Now the pendulum of fashion has swung in the opposite direction. Invasion biology demonizes alien species. In “The New Wild” Fred Pearce argues that this is done for no rational reason. The vast majority of non-native species do no harm whatsoever. To prove his point, the author moves the discussion away from the traditional, but outdated idea of the ecosystem as a closed unit with clear boundaries and clear flows of energy and nutrients, a unit where the species co-evolved, a unit which, therefore, will automatically be damaged by adding or taking away a species. In reality, ecosystems have no water-tight boundaries, and can accommodate new arrivals. The scientifically observed process is ecological fitting, not co-evolution. A situation can, of course, arise, where alien species swamp everything else. For those familiar with the issue, water hyacinth and the Nile perch in Lake Victoria would come to mind, as well as New England jellyfish in the Black Sea and the killer algae in the Mediterranean. According to “The New Wild”, even in these circumstances it is unfair to blame the aliens. It is man-made pollution that destroyed the above mentioned areas and made it possible for aliens to move in. Furthermore, in situations like these non-native species can be essential for reviving an ecosystem, “rebooting” it and paving the way for natives to move back in. But don’t native species cost the economy a lot of money? Fred Pearce has no clear answer to that. But at least he admits it, whereas invasion biologists seem to pluck the numbers out of thin air, adding up factors such as parasite damage in salmon farms, as well as unnecessary and costly eradication programmes. The most bizarre number of all, in my opinion, is the “recreational value” of beauty spots, calculated on the basis of opinion polls in which people are asked how much they would be prepared to pay for visiting a beauty spot should the entry become chargeable. Alien species are so devious that they seem to take from the economy the money that is not even there in the first place. The cost to the economy is an example of the many myths invasion biology has created. These myths, unfortunately, have found their way into policy-making, and are used to justify the kind of “conservation” that makes it somehow morally acceptable to kill some animals in order to help others. Another example of such mythology is the idea of the pristine, of untouched nature that we are called to preserve. What can be more pristine that the rainforest? 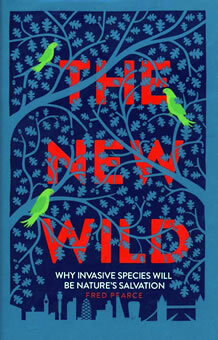 One of the many revelations that “The New Wild” held for me personally is the fact that rainforests are actually gardens and plantations abandoned two or three thousand years ago. “Dark earths”, evidence of human settlement, have been discovered in the depths of rainforests both in the Amazon basin and in West Africa. Fred Pearce devotes quite a lot of space to detailed analysis of how such myths come about. Invasion biology starts with the presumption that alien species are bad; then seeks out research topics to fit in with it. This makes for a biased research base. Even this research is rarely replicated. Furthermore, its application in policy-making shows huge logically unjustifiable leaps from the particular to the general, e.g. what is true of Hawaii is assumed to be true for the whole of the United States, and that, in turn, is assumed to be true for the whole world.